Enterprise has 10 needles, LCD touch screen, NeedleCam, on screen editing, 14x14 inch field, 110 designs, 30 fonts, 120 frames. 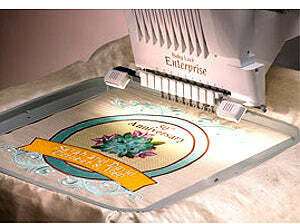 Baby Lock BNT10 Enterprise Ten Needle Embroidery Machine. Nothing can hold back an enterprising spirit and with the right tools everything is possible. Whether you just love to embroider or ready to start an embroidery business, the Baby Lock Enterprise is the right tool that can help you achieve your goals. With 10 needles, you can embroider even the most colorful designs. The processing and stitching speed lets me create designs as quickly as you think of them. And, with a touch of a finger you can achieve flawless design placement every time with the realistic view HD LCD screen, and NeedleCam™ feature - even before taking your first stitch. What's more you can even link additional machines together, plus embroider on a 14 inch x 14 inch hoop! Now that's thinking ahead! PBS host of Sewing With Nancy and business owner for 30 years. Baby Lock Enterprise Key Features. When it comes to the Enterprise’s astonishing 10 needles, you can be overjoyed without being overwhelmed. Large designs, multiples, or even gorgeous 10-color designs can be embroidered at a speed of 1,000 spm with minimal set-up or thread changes. The LED lighting on each spool changes to match thread colors and signals when a spool needs to be changed, so you’ll never lose track of those 10 threads. TruView™ High Definition LCD Screen. Edit and preview your designs on the stunning 8.5 inch LCD TruView Display, with 480 x 800 pixels for the utmost clarity in 260,000 colors. The zoom feature will bring designs to view up to 200% magnification - see any design flaws before it’s stitched. Pinpoint precise needle placement for embroidery designs at a glance. This unique camera scans your fabric to recognize the positioning sticker and positions the embroidery automatically. Editing designs to add your own unique touch - or creating customized products - has never been so fast or so easy. Group design elements together to quickly move or edit the design. You can even see the changes happen instantly on the display screen when you combine, reposition, resize, rotate and mirror your design. 14 Inch x 14 Inch Embroidery Hoop. Need to go big? Then you’ll want the optional 14" x 14" hoop. This jumbo frame is perfect for large projects like jacket backs and quilt blocks. The jumbo hoop is activated through the Palette 9 embroidery software. 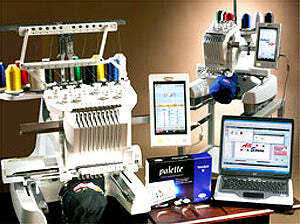 Combined with the Enterprise, Palette 9 becomes the command center for your embroidery project and provides the ability to link up to 4 machines together. 10 needles - 1 position for each needle. Maximum embroidery speed - 1,000 stitches per minute. 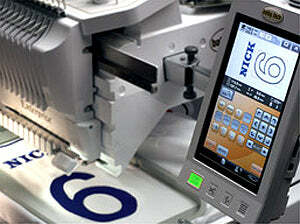 Maximum embroidery fill stitching speed - 1,000 stitches per minute. Embroiders up to 7 7/8 inches x 14 inches (200mm x 360mm) embroidery field or optional 14 inches x 14 inches (360mm x 360mm) frame using Palette 9 Software. 3 USB drives; 2 (Type A) drives, version 2.0 connects with flash drives and CD-Rom drives and version 1.1 connects with mouse, hub, and floppy drives, and 1 (Type B) USB direct connect to a PC. Linking capabilities allow up to 4 machines to connect to Palette 9 software through a powered hub. Optional External USB 1GB Flash Drive. Reads multiple formats (PES, PEC, DST, PHC). 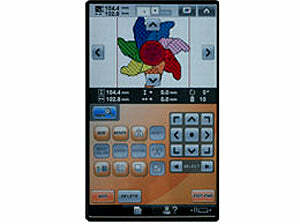 TruView™ HD LCD Color Touch Screen. 160 degrees for optimum viewing. 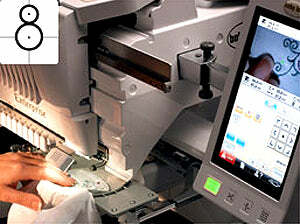 NeedleCam™ Digital Camera for perfect embroidery positioning. Design placement using drag and drop capabilities. Needle advancement (1, 10,100 or 1000 stitch increments). Measurements displayed in inches or metrics. 200% Design magnification on screen. On-screen hoop size indicator shows standard and optional hoops. 5 LED lights with dimming settings to illuminate work area. 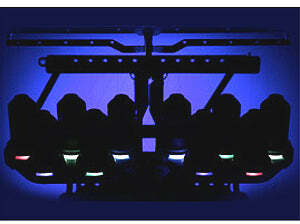 LED spool stand lighting aids in thread placement and lights for thread spool warning. Bobbin system: front loading, vertical rotary hook. Push button, automatic needle threaders. Automatic thread trimmer (upper and lower). Needle bar/frame move key extends the hoop for easy access to the design while still attached to the machine. Start/Stop button with lock feature. Choose units of measure (inches or millimeters). 30 Fonts including large floral alphabet, Baby Lock exclusive script and Greek letters. 3 Monogram fonts designs with frames. Design size change (10% reduction and 20% enlargement) on most designs. Needle forward and reverse position placement (1, 10, 100 or 1000 stitch increments). Design duplication (up to 20 times in both directions). Design Grouping combine designs or letting to move as a group. On-screen count and running time system. Change color selections within designs. All 10 colors can be anchored. Color can be selected by needle number rather than by color. Anchored colors can be changed in the middle of stitching. Assign colors to DST format. 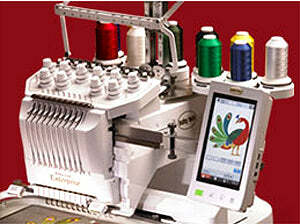 Embroidery speed can be set for individual anchored spools for specialty and metallic threads. Continuous border capabilities and color sorting on border designs. Monochrome option for embroidery designs. Instant needle edge placement with 9 starting and 9 ending positions. Thread color display in 6 options. Custom color displays in 3 options: Original Palette, Custom Palette 1, Custom Palette 2. Hoop sensor advises hoop size for design chosen. Hoop display shows hoop options on-screen based on frame holder chosen. Built-in operation guide with videos. Auto save feature - automatically saves last design when power is turned off or a power failure occurs. Shipping weight (130 lbs. or 59 kg.). Machine weight (92 lbs. or 42 kg.). Warranty (25 years product casting, 5 years circuit boards, 5 years electrical, 2 year parts, 1 year labor). Ask your Baby Lock Retailer about training and service programs like the optional Gold Standard. Baby Lock Enterprise Included Accessories. 7-7/8 inches x 14 inches (200mm x 360mm). 5-1/8 inches x 7-1/8 inches (130mm x 180mm). 4 inches x 4 inches (100mm x 100mm). 1-1/2 inches x 2-3/8 inches (40mm x 60mm).